We’d love your help. Let us know what’s wrong with this preview of Breaking by Danielle Rollins. 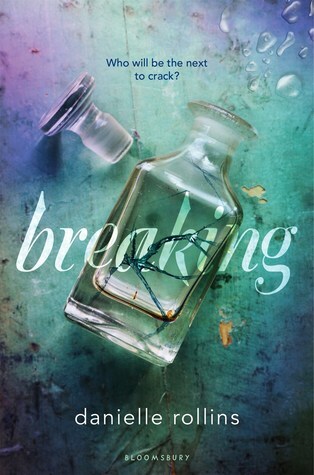 To ask other readers questions about Breaking, please sign up. Do I have to read Burning to read Breaking? I had the opportunity to early review this book and want to make sure they don't tie together since I haven't read Burning. I am very interested in reading this book though. I struggled with Charlotte. I understand being upset about the suicide of your BFFs, but it felt like her inner monologue was glamorizing suicide. She kept thinking things about "not being brave enough" to join her friends in the dark. There was an interesting story line, but it was boring at the same time. Everything felt so dramatic and overemphasized. For me, it got old really fast. Overall, it was a quick read with an intriguing ending, but it lacked a spark and a layer of tension that I was expecting from a story like this. This was my first book by Danielle and I am abso-freaking-lutely a fan of hers now! As soon as I read that this was a suspense/thriller type of book, I was all for it. No questions asked. The dark undertone that it seemed to ooze with every page made me too giddy for words and I wanted it to last a lifetime. Going in, I knew NOTHING about this world and I just found out that I read the 'second' book in the series. They actually seem to follow different characters so I don't feel like I've spoiled myself too much. No harm done! This news made me really happy because I'm dying to know more about this world and now I can read a 'prequel' as I hope for a continuation to this one. I seriously can't wait to get my hands on it!! I feel like my prayers have been answered and I don't have to wait for a release. This book follows Charlotte as she tries to dig through the aftermath of the suicides of her two best friends. We get to witness as her world is torn from under her feet and she starts to question everything she thought was true. I have never read a story like this one and Charlotte was a unique main character, in my opinion. I loved seeing how she reacted to everything around her and she made me proud at times. There were quite a few characters that I did not like but I won't name them in order to keep myself from spoiling anything. But I will say that I really liked Zoe and the dynamic she had with Charlotte. This entire story made me feel like I was walking through a field of landmines where the only way to get answers was to step on each of them . It ripped out many tears from me because there were some brutal events that I couldn't stop envisioning. They were horrendous and it took a while for me to collect myself before forcing myself to continue with the story. With that said, there was also a lot of badassery and savagery that I didn't know I was in store for. A lot of other things caught me by surprise, and I am glad I didn't know about them, because I would've been too intimidated to read this if I had. I really hope I can read more books as dark -and darker- as this one. The only critical comment I have for this novel was that a few things were anticlimactic when it was built up like crazy. I still liked the story a lot but I would've loved for some secrets to have had more 'unf' to them in order to make the story a true 5 star read. Besides that, this is a story that I deeply cherish because it appealed to my dark side and I can't wait for the next one! Breaking definitely delivered the venomous thriller it promised. It was short, sharp and shiny. I managed to whizz through it in one evening, the very night that it appeared on my front door. It helped that the beginning was edgy and drew me in but I will say that it didn’t quite manage to perfectly pace the intensity throughout the story. Maybe because of the character’s mild reactions to the twists and revelations? I understand why they acted like they did but their passivity really dampened m Breaking definitely delivered the venomous thriller it promised. It was short, sharp and shiny. I managed to whizz through it in one evening, the very night that it appeared on my front door. It helped that the beginning was edgy and drew me in but I will say that it didn’t quite manage to perfectly pace the intensity throughout the story. Maybe because of the character’s mild reactions to the twists and revelations? I understand why they acted like they did but their passivity really dampened my own enthusiasm. There were definitely elements of the story that could have - and should have - been expanded on, especially in the second half. The ending was also a little rushed. Cliffhangers normally make or break a book for me but I don’t quite know how I feel about this one. I definitely need more from this world now but I would have liked to see the story wrapped up with a solid conclusion. With all that being said, there was definitely something about Breaking that kept me on the edge of my seat, eager for answers. Everything else about the story hit all the marks but failed to do anything above and beyond that would make this a standout read. I did enjoy Rollins’ writing style. She managed to create a dark, suspenseful atmosphere but some of the dialogue felt a little stiff. The characters were decent enough. I liked that they played into the stereotypical boarding school student/rich kids moulds but had a little more life breathed into them. Charlotte was an interesting protagonist and I liked exploring her relationships with the other characters. I wished Jack had been a little more nuanced but I did like Zoe. The romance - while it did nothing for me personally - was a solid addition to the overall story. It actually had a role to play! I am so sick of unnecessary romances. If the drama had been a little more downplayed (although I know that it is realistic in this setting), I would have been very much on board. Overall? A solid thriller and a decent read, just nothing particularly original. Also, for everyone that is curious about whether this can be read as a standalone, I would say that it definitely could. I know that the storyline was meant to tie in with Burning but I honestly remember next to nothing about that book and found it easy to follow this storyline regardless. Review copy provided by the publisher for an honest review. Well this was interesting. It all got solved a bit too quickly at the end but I like how it was also an open ending. DNF at 17%. I received this book from Netgalley in exchange of an honest review. I am really sad about this. I loved her first book in this series, and when I saw this book would be a book set in the same universe + boarding school + mystery? I just had to have it. I just needed to read it. S DNF at 17%. I received this book from Netgalley in exchange of an honest review. She seemed so ungrateful, people did try to help her, they did extend their hands for her to grab it, but instead she was acting all high and mighty. Also Zoe. Bleh. What a terrible character. I can't even believe she was so different not that long ago. I may have believed it if we had seen it with our own eyes, but now? Nah. Also it was just ridiculously silly how she had packed everything, found a bottle, then was in the car with her mom and instantly changed her mind about where to go. It was just hilarious. I just had no interest in her friends (though I did think they were pretty terrible friends). They are dead when the story starts so we just see what they are like through Charlotte and her flashbacks. I feel it would have been better had they all been alive. That their suicide would have happened as the story was unfold. Now I just didn't know what to think of either Devon or Ariel. Another option would be to have the first chapter be about the suicide and then rewind back to the time before it all happened. Before it all went wrong. Plus the OMG suicide is so great message was pretty big in this one (sorry, but I would call it that as Charlotte keeps talking about joining them in the dark and how she wished she was able to do that). It was just uncomfortable and made me unhappy. Ah yes, and the fact that they apparently drank alcohol like it was water (at least that is how it seems to me, considering they just had alcohol everywhere and didn't hesitate to drink it). So yeah, an anticipated read which failed to meet my hopes. Such a shame. While BREAKING certainly met its goal of being a thriller, I was mostly disappointed with the book. The hints of the supernatural were disappointing and though it kept my interest, there were too many questions left unanswered for me to be completely satisfied with the read. To be fair, I read BREAKING in one sitting. It kept me completely glued to my seat, and I was desperate to know how it ended while I was reading it. Once I finished and thought abou Review courtesy of All Things Urban Fantasy. To be fair, I read BREAKING in one sitting. It kept me completely glued to my seat, and I was desperate to know how it ended while I was reading it. Once I finished and thought about it, the more I realized I had some issues with the book. One major problem I had was that Charlotte's friends, Ariel and Devon, are already dead at the beginning of the book. There are flashbacks, but not enough, in my opinion, for you to really understand Charlotte's friendship with the two of them. It was hard to get myself to care about Ariel and Devon and what happened to them, because I didn't have any connection to them other than that Charlotte cared about them. Another issue was the ending. It seems to end on a cliffhanger, as if there should be more books, but I don't see any news about further books in this series. So that was disappointing. Had I realized when I requested it that it was a companion novel, I'm not sure I would have read it, but you don't need to have read BURNING, the companion novel, to understand what is happening in BREAKING. I easily picked up all the drama, and in fact think I may have appreciated the thriller aspects more since I didn't have hints from BURNING. So, enough though I was entertained by BREAKING, ultimately I was left feeling unfulfilled. If you enjoy mysteries and thrillers, BREAKING might be up your alley, but if you like a little more closure when you read a book, I can't confidently recommend it. Ah. I loved every second of this book too... and could not put it down! I hope there are going to be more in this series. And if you haven’t decided that then please do decide. I want more! ANd if you read this book... you will too! Brilliant series so far! This started off with a contemporary feel, Charlotte struggling with the loss of Devon and Ariel, who to her had been like family, her thinking that she was the reason they took their own lives as well as juggling the less than perfect relationship she has with her mother and the feelings she has for her best friends ex-boyfriend. It then had the feeling of a mystery, with the search for why they died and then sci-fi/paranormal elements were added. It was pretty boring to start off with, I wasn't all that invested in the story, but about halfway through things started getting interested and I wanted to see how the story played out and figure out what the hell was happening. I'm not sure my feeling towards the main character Charlotte, there wasn't really anything super interesting about her that made me connect to her. The way it ended gives the impression that there's gonna be a sequel. There is another book related to this, Burning, but I checked it out before reading and someone said that you could read this without reading that. I think I'd probably read the sequel, if there is one, if I got an arc, like with this or it was really cheap on Kindle . Charlotte’s two best friends both killed themselves in the last few months. She is obviously devastated but she’s also certain that something was up with them… Just before being asked to “take some time off” from school, she finds a clue that one of her friends left her. That clue is labeled 2/3. She then does her best to discover the truth while dealing with the fact that she’s now basically alone, and that her body is doing weird stuff……. This was far from perfect, but the story grabbed me from the first chapter to the end and I couldn’t put it down. I both felt Charlotte’s pain and anger but was weirded out by the times she wasn’t feeling, mostly because I didn’t stop feeling and to me, it was hard to understand and picture. While I enjoyed the characters that Danielle created, the story did not have that pull I'd expect to go along with the mystery aspect. Overall, it's a forgettable story that I wanted more from. I devoured this book. The pacing was intense and the story drove me to keep reading. I read with horror, with tears and with curiosity. I loved the characters and I'm quite excited to read the sequel because I assume with that ending, there will be a sequel. I...I...this book was just terrible. Before I read this book at the request of a co-worker, I read the jacket and told her my worry that it would glorify suicide to some capacity. And this did. Twice. In the second chapter: "Devon followed Ariel to that dark place knowing I would never be brave or strong enough to meet them there." Then a page later "Nice girls don't kill themselves. Nice girls get left behind. Nice girls cry in their beds alone." But then there is this severe departure. The plo I...I...this book was just terrible. Before I read this book at the request of a co-worker, I read the jacket and told her my worry that it would glorify suicide to some capacity. And this did. Twice. In the second chapter: "Devon followed Ariel to that dark place knowing I would never be brave or strong enough to meet them there." Then a page later "Nice girls don't kill themselves. Nice girls get left behind. Nice girls cry in their beds alone." But then there is this severe departure. The plot for this novel just didn't make sense and the characters were so bland that I was bored. Charlotte goes through some motions, but I never found myself feeling anything for her loss because of how poorly this novel was staged. We don't really see either of her friends alive and I think we needed that. We especially needed that with Ariel, considering Devon is more of a past side character who just doesn't seem to really matter. It felt like she was just a number to be dead rather than someone Charlotte actually cared about. The plot takes some very strange turns into the more supernatural when it really did not lend itself to that. This felt scientific not filled with some kind of superhuman abilities at the end of the novel. I felt like the relationship with her mother was poorly constructed that I didn't feel anything either way for her. She was neither a villain in my mind nor was she misunderstood. She was just there. A strange catalyst with no driving force for doing so. I'm not even sure I understand what kind of doctor she was. Super quick read and easy enough story to follow. It was slow to build up speed. I had to get about 60% through before something really happened. The ending felt rushed and maybe a little predictable but it read like a stand alone. I'm slightly curious about the next book. When I requested this ARC, I did not know it was the companion novel to Burning. It does not read like a companion novel so I can say if you choose to read this without reading the other, you will be okay. Charlotte, the MC, Super quick read and easy enough story to follow. It was slow to build up speed. I had to get about 60% through before something really happened. The ending felt rushed and maybe a little predictable but it read like a stand alone. I'm slightly curious about the next book. Charlotte, the MC, was easy to connect with and easy to follow. She was just complex enough to stay interesting and not completely predictable. She was flawed yet I could identify with her. She was used to being in the shadow of her two best friends, Devon and Ariel. When Devon and Ariel commit suicide, it throws Charlotte's world on its head. Charlotte knows it is not just a coincidence, she knows something more is going on. She suddenly opens her eyes to everything that is going on at Underhill Preparatory Institute. She knows something dark and sinister is taking place and she is going to figure out what, or who, is behind it all. I don't know what compelled me to request this book. I hated the first book, which isn't a good start. I think it was the cover, or the synopsis, or maybe I just decided to give the companion novel the benefit of the doubt. Breaking, however, did not land high enough on my scale to either make me enjoy the book or save it from its predecessor's fate. I didn't like Breaking. I thought it was glamorizing suicide. I thought it was over-dramatic. But, most of all, I thought it lacked the umph necess I don't know what compelled me to request this book. I hated the first book, which isn't a good start. I think it was the cover, or the synopsis, or maybe I just decided to give the companion novel the benefit of the doubt. Breaking, however, did not land high enough on my scale to either make me enjoy the book or save it from its predecessor's fate. I didn't like Breaking. I thought it was glamorizing suicide. I thought it was over-dramatic. But, most of all, I thought it lacked the umph necessary to pull itself from the muck. This was basically my face when reading -- enough said. OMG!!!!! I finished this book five seconds ago and my mind has officially been blown. The characters are crazy, so vivid and just there !! Everything that happens messes with your brain, leaves you with questions, and makes you gasp... the story is genius! Mysterious, creepy, dangerous, cruel: and all in the best way possible. This book needs a sequel so bad. I'm so surprised I've never heard people talking about it! This book has many mentions of suicide, but it's not really talked about in OMG!!!!! I finished this book five seconds ago and my mind has officially been blown. The characters are crazy, so vivid and just there !! Everything that happens messes with your brain, leaves you with questions, and makes you gasp... the story is genius! Mysterious, creepy, dangerous, cruel: and all in the best way possible. This book needs a sequel so bad. I'm so surprised I've never heard people talking about it! This book has many mentions of suicide, but it's not really talked about in the way you expect. It's more of a mystery/thriller and is just part of this fiction story. Do not expect any Thirteen Reasons Why content, it's all about the mystery. Last year I read a very creepy and fascinating book called Burning. So when I received the companion novel last week from Bloomsbury Australia, I couldn't wait to read it. Charlotte attends a prestigious boarding school because her mother is a very busy doctor who travels a lot. Weston isn't the ideal home, still she's managed to make two friends who are more like family. But when Ariel and Devon commit suicide within a month of each other, Charlotte's left all alone and with so many questions. No Last year I read a very creepy and fascinating book called Burning. So when I received the companion novel last week from Bloomsbury Australia, I couldn't wait to read it. Now she feels like an outsider and doesn't even want to fit in. Her only real connections are her dead friend's ex-boyfriend and her nosy new roommate. When Charlotte stumbles onto an enigmatic message from Ariel, the note sets her on a path filled with dangerous secrets, unlawful experiments, and self-improvements bordering on superpowers. Wow. The writing in this book is exquisite. So intimate and lyrical that Charlotte's words dragged me into her life instantly. As soon as I read the Prologue, I wanted to follow her down this very dark path. I felt a lot of things for this young girl--confusion, pity, anger, frustration, pride--and all at the same time. Her life is a lonely one made better by two friends who, as the plot starts to unravel, don't seem as wonderful as they did at the beginning. Actually, even Charlotte isn't exactly a good girl. She's odd, considers herself average, an outsider, and certainly sometimes behaves in a questionable manner. But she's determined, and sympathetic, wants to explore who she really is. Even as the dark mystery of what happened to her friends pushes her forward and makes her do some very risky stuff, I couldn't help but feel sorry for her. I just wanted her to find her own way to happiness and be free of her mother's restrictive control. BTW, it was so cool when a very familiar, vital character bridged the connection from Breaking to Burning. There are several clues along the way, so many breadcrumbs left scattered for the reader to make the connection between what happened at the Brunesfield Correctional Facility and Charlotte's dilemma. I also loved the many fairy tales threaded into the overall storyline. Very clever! Breaking is an intense and very intriguing book that's so addictive I was totally engrossed into the story. Walden might not be juvie, but it's still a place where the students are isolated and are imprisoned by the endless drive to succeed. The narrator dives headfirst into some pretty shocking situations, but is very honest and analytical about her motivations. This story turned out to be an excellent dark thriller that toes the line of the supernatural as brilliantly as the first book. It also leads the reader to a very satisfying conclusion. "But I dream of the woods again. Shadows and laughter and running. Searching for the two people I can never find." Ugh, I really was considering whether writing a review of this book or not, because honestly? I feel like I don't know what to say about it. Did I enjoy it? Probably. Did it blew me away? Definitely not. The thing with this book and what made me buy it in the first place was the cover and because I wanted to read something by Danielle Rollins aka Danielle Vega that wasn't horror or paranormal. And when I knew about this one I immediatly wanted to pick it up. And well… let's be real here, the cover helped. A LOT. So even though the book itself didn't have the most amazing reviews, I went with pretty high hopes, expecting something that was going to knock me out of my seat. And… for the most part, it wasn't. "Once upon a time, there were three beautiful sisters. Their families decided they didn't want them anymore, so the princesses ran away and hid inside an old castle in the middle of the woods. […] They decided they would never leave the castle. Ut would be their home, forever and ever." First of all let me start by saying this is part of a companion series, but you can totally read it as a standalone. The thing is that it was a bit predictable to me without knowing anything about the world, so maybe if you have read Burning, which is the first book, everything would be way more obvious to you. It was very fast and easy to get to, that's for sure. I didn't have any trouble remembering events or things or certain things that happened to the characters in the past. I read it in one day, and you know me: I'm a very slow reader. I like to take my time while reading a book and I get so distracted. Anyways, back to the review. Of course I was really glad it didn't have any horror, and it was set in a boarding school. I don't know why but I love reading stuff that happened in boarding schools, it adds such an eery and creepy vibe and it makes the whole experience so much better. And that's exactly what I felt with this one. "I saved the princess, though. I ticked her into the pocket of my shorts before I pushed the window close and crept back into bed. Just that one time, I saved her." My main problem I believe was with the characters. I had very mixed feelings about them, and I didn't really connect with them as much as I would have liked to. There were some parts I enjoyed and understood, but the mayority of the things the protagonist did did not really make sense to me. What I really enjoyed some of the twists the story had, and honestly did not expected them (I cannot tell you otherwise it will be a spoiler) but I was a bit disappointed by the ending. As I said at the beginning of this review, it was a bit obvious to me what was going to happen. I expected a punch that would surprise me, and unfortunately it did not come. However I think I will be reading more by that author or continue the series. I'll be keeping an eye on the next installment and see what's about! The characters are imperfect. In fact, they arent even really likable for the most part. The more Charlotte reminisces about Devon and Ariel, the more cruel and sadistic they seem. Some scenes are truly horrific and disturbing. Like if you love animalsone scene will give you some serious anxiety. I held my breath through that one. The anticipation and fear are too real. Charlotte is one of those characters that you sort of sympathize with, though she does have quite a bit of self-pity. She thinks shes less attractive, less intelligent, etc., than everyone at her school. There is a total of one scene that shows where that insecurity comes from-the pretty much abusive mind games her mother forced her to play as a child. I wasnt entirely sold on her character. She was okay. As the story progressed, she did get better. She became rebellious, angry, and a little vicious. Not everything was so black and white. The ending. Violent, vengeance-fueled, incendiary its sort of evil, but also justified. It was deeply satisfied with the ending. The romance. There is so much build up that makes you think its something its totally not. Something more. Maybe Charlotte is blinded. Whatever. But the reader can see. Theres chemistry sure. And lust, definitely. But anything else, I wasnt getting any strong emotions, even before the numbness started to set in. 'Breaking' is an incredibly well done YA thriller that fans of the genre are going to devour. Mysteries and thrillers are at the top of my favorite genres, and by this point it's a bit hard to fully capture my attention. This book grabbed me right from the very beginning and sucked me into Charlotte's world. I ended up reading the entire novel in one sitting. I loved all the twists and turns, the secrets and lies, and the supernatural aspects the author included. It made the story unique and captivating, which is definitely a hard feat to accomplish. I loved getting to know Charlotte and watching her change throughout the book. The author chose to write in the first person point of view - from Charlotte's perspective - and I'm so happy she did. It's by far my favorite style and does the best job at allowing the reader a deep and personal connection to the narrator. It's a perfect fit for this novel and any other writing style wouldn't have done the story justice. The plot was fresh and engaging, with plenty of twists that you don't see coming. I thought I had it all figured out a few different times, only to have my theories demolished time and time again. The fact that the author could stump me like that was a huge plus for me, as not many can manage to do so anymore. The characters were rounded with distinct traits and personalities that made them realistic - especially Charlotte, our main character. I was able to easily identify with her from the very beginning of the book. She's definitely flawed, but has a lot of positive traits too. The secondary characters were also decently rounded and helped bring the story to life in my mind. I loved the setting too - even though some people might think the whole private/prep school is too common. It felt like the perfect place for the story to take place - it all fit together seamlessly. I highly recommend this book to fans of YA mysteries, thrillers, suspense, contemporary, and paranormal/supernatural fiction. A chilling start and I really liked the idea behind this. Our narrator is, understandably, upset as her two best friends have committed suicide. She is struggling to keep focused in school, but when she gets a message left by one of her friends she is determined to do whatever’s needed to stay there while she tries to work out what’s happening. The spoiler-free review will just mention that a school is a great place to hide secrets. Sometimes the people who are meant to be looking out for you are A chilling start and I really liked the idea behind this. The spoiler-free review will just mention that a school is a great place to hide secrets. Sometimes the people who are meant to be looking out for you are the ones who often have most to hide. While I loved the start I felt it simply couldn’t maintain the intensity. Some characters acted in ways that made little sense, and I found it hard to believe that a project of this magnitude would not have drawn attention to itself over the years. This was my first book by Danielle Rollins. Breaking is the companion novel to Burning. I did not read the first book in this series, but this companion novel almost seems like it could stand alone and does not need prior knowledge. I really wanted to like this book. It had all the ingredients and making of a 5-star YA thriller/mystery, but it just came up short. The characters were not fully developed. With Charlotte being the main character, she was the one to be the most developed. But, even This was my first book by Danielle Rollins. Breaking is the companion novel to Burning. I did not read the first book in this series, but this companion novel almost seems like it could stand alone and does not need prior knowledge. I really wanted to like this book. It had all the ingredients and making of a 5-star YA thriller/mystery, but it just came up short. The characters were not fully developed. With Charlotte being the main character, she was the one to be the most developed. But, even other supporting characters only sang a few notes and not the whole song. I felt like all of the characters were very unlikable. They had no characteristics or situations where the reader could latch on to them and truly feel something for them. However, the plot and mystery of the novel had me continuing to read. It was just enough to keep me latched and was swaying on the edge of being very good. The ending was just weird enough and totally out of left field that it had me scratching my head, but taking a step back, you could tell that the book was heading in that direction. I think this book is an okay summer read to be read in between books, but maybe not a book to hang your hat on. 'Breaking' tells the story of teenager Charlotte Gruen, a senior at Weston, a private boarding school for privileged and talented students. I notice that in the Goodreads description of the book, it says that Charlotte attends The Underhill Preparatory Institute - not sure if the name of the school was changed after that was written? Neither here nor there. Breaking is a companion book to 'Burning,' but can most definitely be read as a standalone novel. I have not read Breaking (yet) and don't feel like I was missing anything. Charlotte's mother is a high achieving and pushy doctor, who wants the best for her daughter... at any cost. If you're think this sounds like a typical trope of YA fiction, think again. Breaking is a novel full of suspense and twists, as Charlotte fights to discover what has caused the recent deaths of two of her friends. It was a quick read, that kept my attention throughout. I think it would be enjoyed by teenage girls in particular. Breaking is the exciting follow-up to Danielle Rollins' Burning! Though, it's considered a companion novel, I would still recommend reading Burning first. There will be characters and events from there that will be mentioned in this one that without prior knowledge of them, it might leave you a bit confused. I found Breaking to be a bit more...myster I received this ARC from the publisher, via Netgalley, in exchange for an honest and voluntary review. I was in no way compensated for this review. Breaking is the exciting follow-up to Danielle Rollins' Burning! Though, it's considered a companion novel, I would still recommend reading Burning first. There will be characters and events from there that will be mentioned in this one that without prior knowledge of them, it might leave you a bit confused. I found Breaking to be a bit more...mysterious than its predecessor. Granted, it's probably the mystery itself that had me more hooked! It's definitely different from the first book in a lot of ways, but there's still that air of familiarity that will have you linking the two together within time! Charlotte is having a rough go of it lately, her two best friends, Ariel and Devon, have both committed suicide a month apart. Charlotte is left feeling lonely, confused, and all other sorts of messy emotions. Her mother is ready to withdraw her from her very elite private school since her grades are suffering and she's skipping classes. It's the night before she's set to leave that she finds a strange bottle among Ariel's, her roommate and best friend, things. She drinks it, thinking it was nothing more than booze that her bestie hid from her. It's not until the next morning that she realizes it was a clue left behind for her. Ont he bottle is 2/3. She and Ariel would play a game where Ariel would leave clues behind that were labeled 1/6 or such and at the end would be the prize! Charlotte thinks that maybe by finding the clues, she might be able to figure out why Ariel (and Devon) committed suicide. Charlotte tries to dig through her friends' things, struggling to find clues. While around her, it seems other weird things are happening. Her new roommate, Zoe, seems to be keeping secrets from her, not that they were close anyway. Her friend's ex-boyfriend, who she had a serious crush on, starts paying her more attention. And she can't help but feel like something is definitely off. There's this overall sense of weirdness and secretiveness going on throughout the whole story. Even when we start to get an inkling of an idea, it's nothing concrete, the mystery at large is still a mystery! The suspense to this one was pretty awesome! As I said, you know something is off, something weird. Even Charlotte know this, but she can't quite fit the pieces together. We get quite the startling surprise fairly early too. One that will slowly begin to tie this book and Burning together. We get little hints, little tastes, and by the end, we're going to get one big picture! But alas, there's still questions! Those annoying little questions. And worse yet, I don't know if there are any more books! There has to be more books! I wouldn't say we entered detrimental territory, but pretty close! It's always the little things that get left unanswered. Wondering who all was involved with this mystery that was happening! Why was it happening? What exactly were they trying to do? Perhaps there are more books to come and those questions can't be answered yet. But at the same time, I feel like we're missing something! There were way more details to this situation than I can really divulge in. So sorry for my vagueness, again! As before, we have a little bit of romance going on in this one. I mentioned Charlotte crushing on her friend's ex-boyfriend, Jack. Like before, its very little. Hardly even there. I can't really say if I liked it or not. Jack and Charlotte have a history that we aren't really privy to, we get little hints of flashbacks, but I don't feel like it was enough for me to care about these two as a couple. I'm not sure if they're being a couple was meant to add to the story. Jack isn't quite meant to be written off though. This book, you guys!! There is soooo much I am wanting to talk to you about it, but I can't because of spoilers. Errg! The ending though, it will really send you through a trip! It's mind boggling!! So many questions! So few answers. There has got to be another book! There just has to be!! yet' it's still too early to really know for sure! I just hope there is! My sanity is at risk here! Breaking was a remarkably twisted read that will leave your head spinning, but I mean this in all the best ways! Who doesn't love a mind-twister? A book that leaves you guessing through its very end! Yes, through the ending, not until, because as I said, I still have sooo many questions! I truly hope Danielle isn't done with this world yet, there is still so much to know from it and I hoping that next year will bring us a conclusion! If you love twisted read that intrigue and captivate you, this is one you will not want to pass up! this is so different?? ?¿¿¿؟؟؟؟؟؟ i love it???? 1st book i read from this author and I really like it! I planned to red her other books as well!